Here in Korea, people finding money or things and returning them to the police or to the owner is not news. It is the normal thing to do. Last year, an EPS worker lost his bag with money in it. A Korean found the bag and returned it to him. 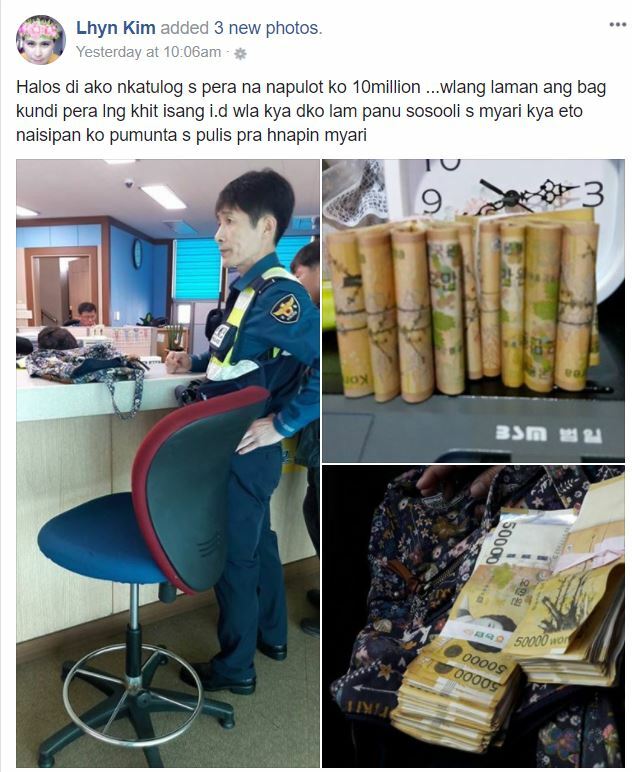 Last weekend, a Filipino marriage immigrant found a bag containing 10 million Korean won or the equivalent of over 440,000 pesos. She didn’t see any identification in the bag. It only contains the money so she didn’t have any idea to whom it belongs. Ms. Lhyn Kim did the right thing by taking the bag to the police. She was told that she could get 20% of the amount if six months have passed and no one will claim ownership. Lhyn said in one comment that she is not expecting anything and what’s important is for the owners to get the money back. Ms. Lhyn Kim lives in Gwangju City and she operates a pre-loved boutique. She is also an online seller of Philippine-made goodies. We asked Ms. Lhyn Kim for more information about herself but she is currently busy with family matters. Nevertheless, we will wait for her longer response but in the meantime, we would like to share this information with the Filipinos in South Korea because what she did is truly the right thing to do. We salute you Ms. Lhyn for your good deed!